About three years ago, we had just moved to a new city, and I was in the midst of unpacking our belongings, homeschooling our oldest, adjusting to a very cold Virginia winter, and eager to get settled and make friends. 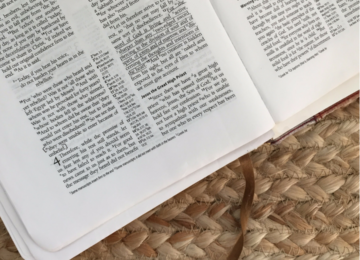 I was reading my Bible, trying to maintain as much normalcy as possible and longing for connection with the Lord, but it felt empty. I would open my journal, write down some thoughts, and then open my Bible, hoping for some fresh insights to guide me through my day. Each time, though, I walked away feeling as if nothing was happening in my heart. I guess I would liken it to working out every day, eating a strict diet, and then getting on the scale to see that you hadn’t lost any weight and your clothes were just as snug as they had been when you began your ‘get healthy’ plan. But I’ve learned that the seasons of empty, stagnant, or dry Bible study are invitations to press on. To keep drinking from the well believing that it never dries up, it will fulfill, and through the power of the Holy Spirit, our hearts will be changed. 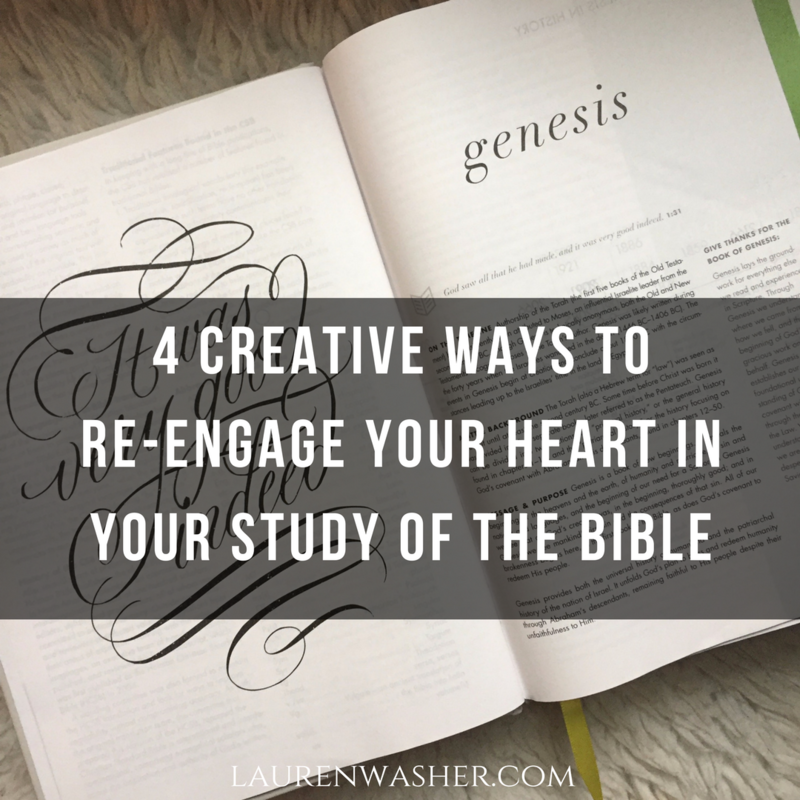 So, what do you do when reading your Bible feels empty? When you go to study a passage of Scripture and you feel like your heart isn’t being stirred? First of all, you pray. No study of Scripture will work its way into your heart without a deep dependency upon the Holy Spirit to use the truth to sanctify you. The Word of God is powerful, yes, but we need the Spirit’s guiding influence to understand the truth and apply it to our lives. 1. Read through the Psalms looking specifically for characteristics and behaviors of God. During my season of spiritual dryness three years ago, I started a study through Psalms about God. Each day I would read a Psalm, and when I came to a characteristic of God, I would place an “A” beside it. Then, I would go back and write a little summary of that verse in the margin. This study was powerful, and I quickly experienced a shift in my heart. As I studied about God, I was moved to worship him. 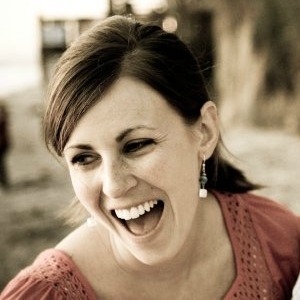 John Piper says, in his book Reading the Bible Supernaturally, that the aim of all Bible reading is “that God’s infinite worth and beauty would be exalted in the everlasting, white-hot worship of the blood-bought bride of Christ from every people, language, tribe, and nation.” Studying about God’s character will move you to this end. 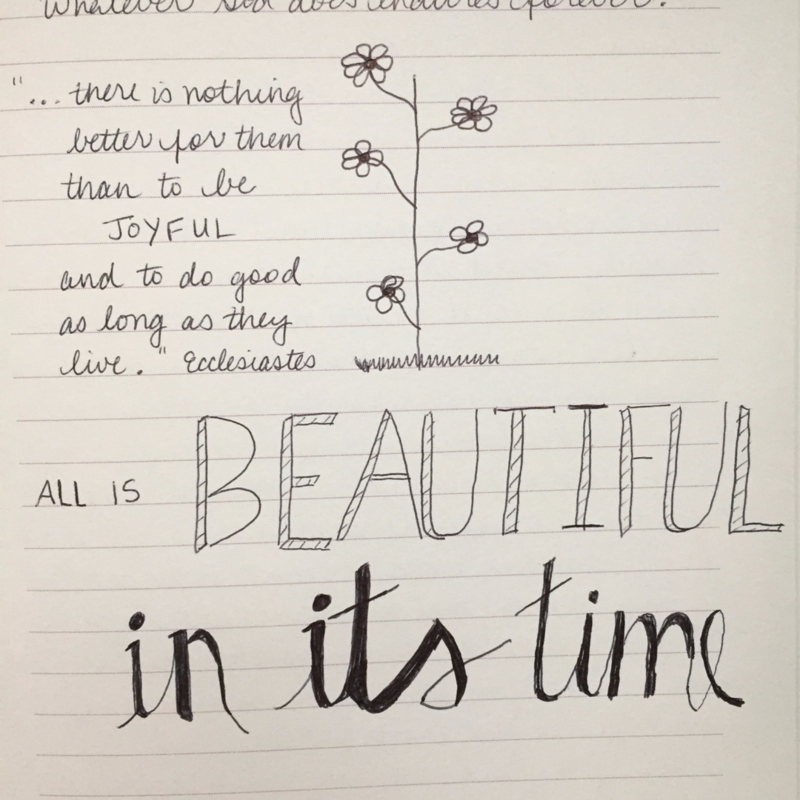 During a study of Ecclesiastes, I would read a short passage and after I had written down some thoughts in my journal, I would choose one word or phrase, and underneath my summary, I would write it out in my best calligraphy (which isn’t awesome, but that wasn’t the point). Each day I walked away from my study with a phrase solidified in my mind because I had spent so much time writing it out artistically. You could do this in a number of ways: painting, drawing a picture, writing something on your hand, but the key for me was that I remembered what I had read and it remained with me throughout the day. 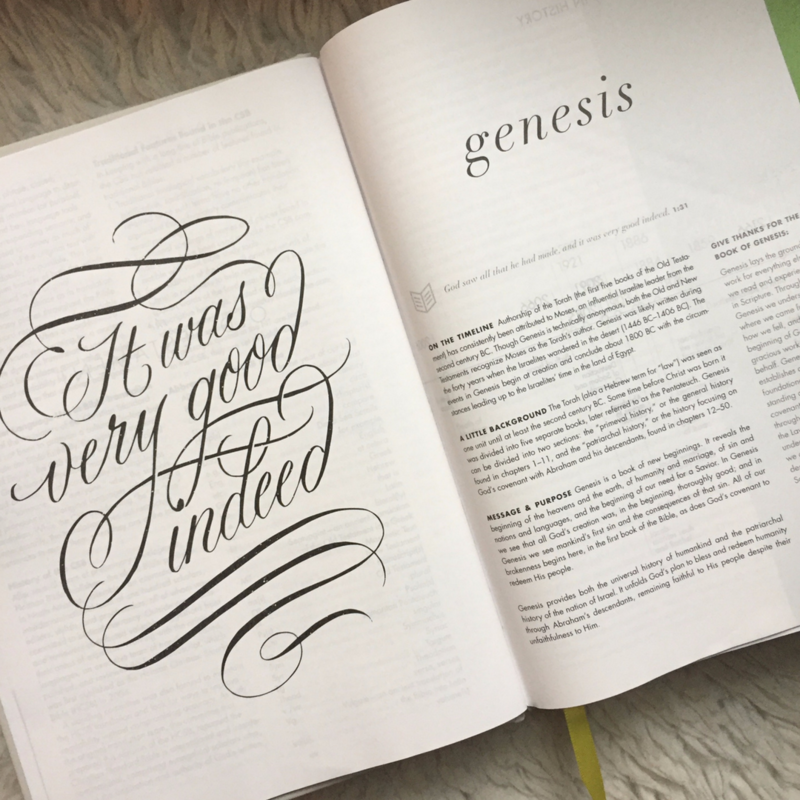 Meditating on Scripture is a great way to engage your heart, and being artistic with something you learned can help to make this happen. 3. Do an Inductive Study with a friend (or group of friends). This fall, our community group has been going through 1 & 2 Thessalonians together, following the sermon series at our church. Each Wednesday when we gather together, we look at the passage for the coming Sunday. We take a few minutes to read over the passage on our own, and then we come together to write down our observations and note our questions. Then we move into Interpretation and Application, discussing what we think the passage means and how we can apply it to our lives. It has been a long time since I’ve done this in a group setting, but I will tell you that it has been such a gift. Gathering with a group of believers to study God’s Word together will enlighten your mind, give you new things to think about, and help you to look at Scripture in ways that you might not have on your own. If you feel like you just aren’t getting anything out of your own Bible study, I would encourage you to grab a friend and spend some time together digging into God’s Word. I think you’ll be amazed at what you uncover, both in your mind and your heart. 4. Read through the Bible as quickly as possible. Now, this last one is one that I haven’t done since my first semester of Bible college, 18 years ago (wow, that makes me feel old). 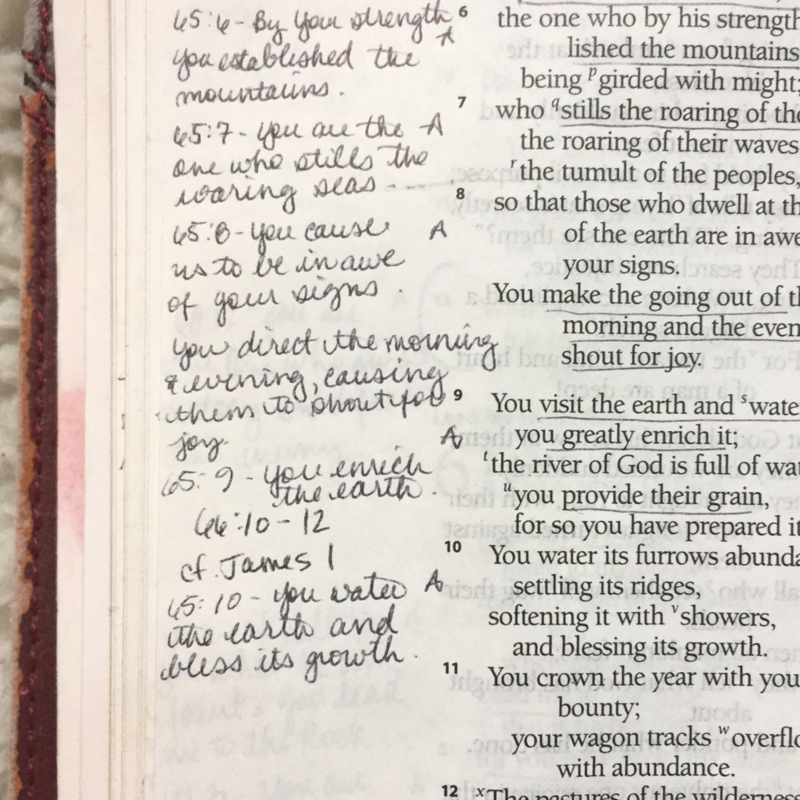 But I was inspired by Hunter Beless, from the Journeywomen podcast, who recently read through her Bible in a little over 60 days. Why? The purpose is not to be able to say that you read your whole Bible, but rather to gain a better understanding of the whole story of Redemption. Each book of the Bible is part of a bigger story, and sometimes we either lose sight of this or we just don’t grasp how that small part fits into the entire narrative. Many of us have knowledge of stories throughout the Bible, but piecing it all together helps us to understand what God has been doing since the beginning of time. This year I have done a lot of Inductive Bible study. And I have enjoyed all of it. But in the past several weeks, I noticed that my heart wasn’t as engaged. My journal entries feel a bit shallow, my mind is tired, and I feel like I need to do something to switch up my regular time of Bible study. Beginning this coming Monday, November 13, I’m going to read through the Bible as quickly as I can. I won’t be following a reading plan with set chapters for each day. My plan is to open it up, and simply read. I’ll have a pen in hand to make notes as I go along, but my purpose is to reacquaint myself with The Progress of Redemption. Want to join me? I’ll be marking my journey periodically on Instagram and Facebook, so you can see how it’s going there. I couldn’t help but wonder if some of you are experiencing a similar spiritual dry spell. If you are, this might be a great way for all of us to have our hearts awakened once again to God’s work — past, present and future. Regardless of where you are in your study of God’s Word, I want to encourage you to be diligent in maintaining a consistent and meaningful study of Truth. The more we invest in His Word, the more we will draw closer to him, the better our hearts will align with his purposes, and we will ultimately live our lives in worship of God. Love this, Lauren! It’s the first year in about 5 years I haven’t been able to participate in a Bible study and it’s been hard for me to find my own groove. Some great tips here!